We made it out of the marina! Despite having watched many boats leaving over the last few weeks, I hadn’t felt any great urge to get gone this year, until just in the last few days, my leaving lust finally kicked in. Just in time for a storm to roll in…. But never mind we were still running around getting things ready and it allowed us one more leaving party. On Saturday 5th May at 5:30am we slipped our lines, waved to friends as we went past and joined a line of 5 boats heading to sea. Slowly over the sand bar at the entrance, but we never had less than one meter under us, so no worries there. Once clear of the shallows the boats peeled off in different directions; some turned east, a couple kept on heading west with us. It was colder than expected, and swellier than expected. Socks had to be called for and Colin kindly went and fetched me some as going below was a no-no for me at that point. I was regretting not taking any Stugeron. A F5 wind blasted us off the hills, so up went some sail but the angle wasn’t that great; still it gave us some lift with mainsail alone. Our speed was up over 6kts then down to 4 and the wind was all over the place. After the NW off the land we had headwind at Cape Spartivento as we’d been warned, then a lovely southerly that had us sailing, engine off for the grand total of fifteen minutes, at which point our speed had got so slow we wouldn’t have been in until midnight. Then a bit of downwind motorsailing with the main out on a preventer, before it crept back around to a headwind. The swell did ease off though and my stomach settled as sailing memory returned. The sun warmed me up enough that the socks came off, then back on as clouds bubbled up early afternoon. If my feet are cold, the rest of me is cold! The coastline is lovely for sailing down, we’d only even passed by before in the dark. The Aspromonte hills made a fine backdrop for watching the world go by. And as we came around the bottom of Italy’s toe, Etna appeared before us, her tops draped in cloud. Just when all seemed so bucolic that I was contemplating a nap, Colin spotted a line of white horses ahead. 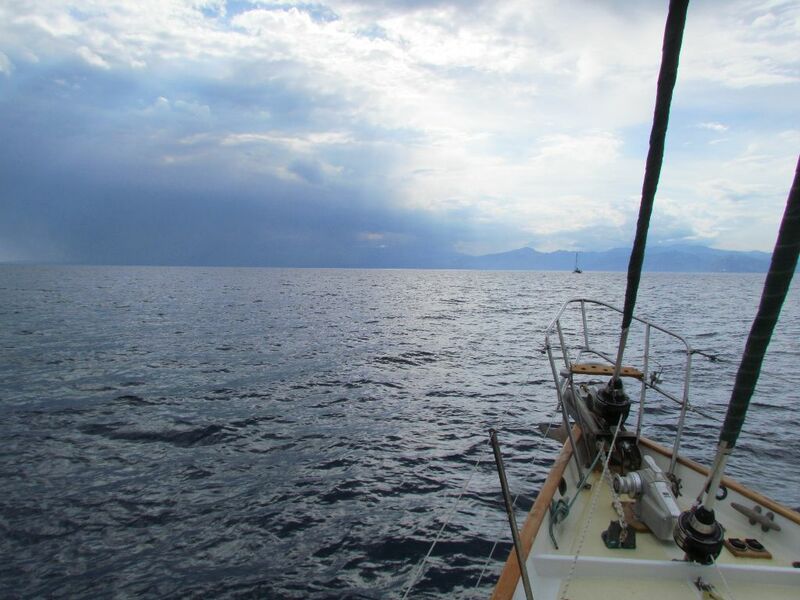 The wind was spurting out of the Messina strait, chopping up the sea which took away some of our speed. Things did calm down, but the wind settled into a westish direction. 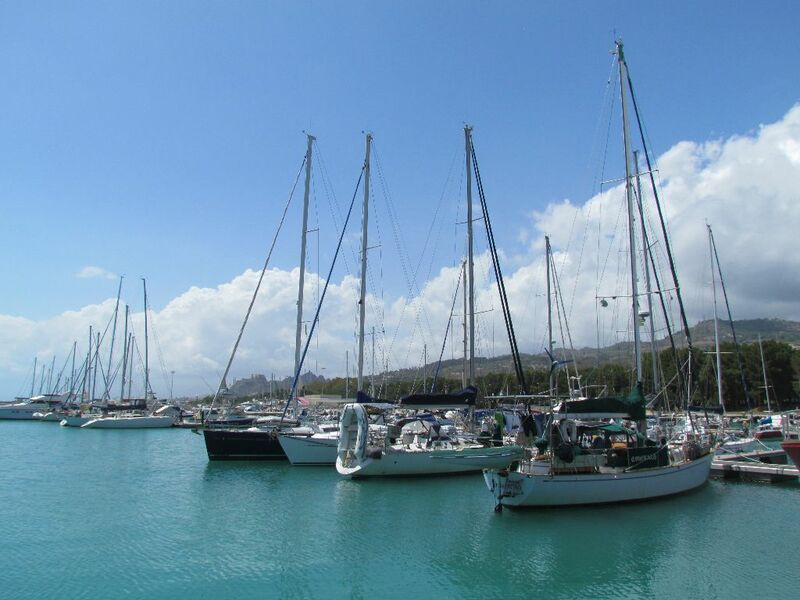 Ahead of us, Sicily was now wreathed in grey and black as a thunder storm rattled around. Gloom, doom. As if they sensed our mood, dolphins then arrived and cheered us up as they swooped and glided around Emerald’s bow for ten minutes or so. Such an amazing experience to look down and make eye contact with these magnificent creatures. However, they must have been camera shy, because as soon as I fetched my camera, they swam off. It was a good shakedown trip as we were able to get all three sails up at one point. We have a few items to add to jobs over the next few days….. A genoa sheet block that makes a noise very like fingernails on a blackboard…. A jammed furling line in the staysail…. but no major damages to report. 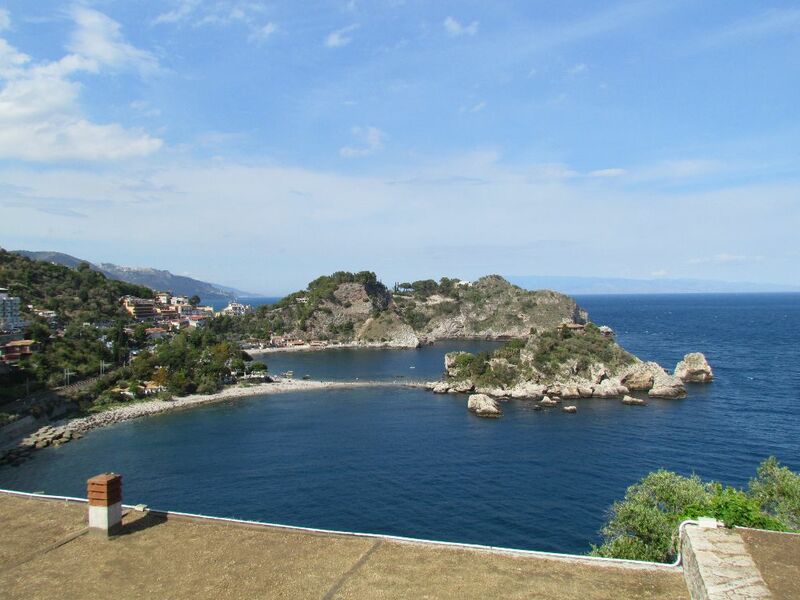 There were 5 boats anchored at Taormina when we arrived but still plenty of space. We slotted ourselves in underneath the cliffs. Then we heard an almighty rumbling sound – had the thunder storm returned? Nope, just a very noisy train running along the coastal track. Somehow we’d forgotten about the trains from our last visit in 2014. As ships went by out at sea their wake would give us a small roll, but after an early start and long day there wasn’t much that could keep us awake that night. 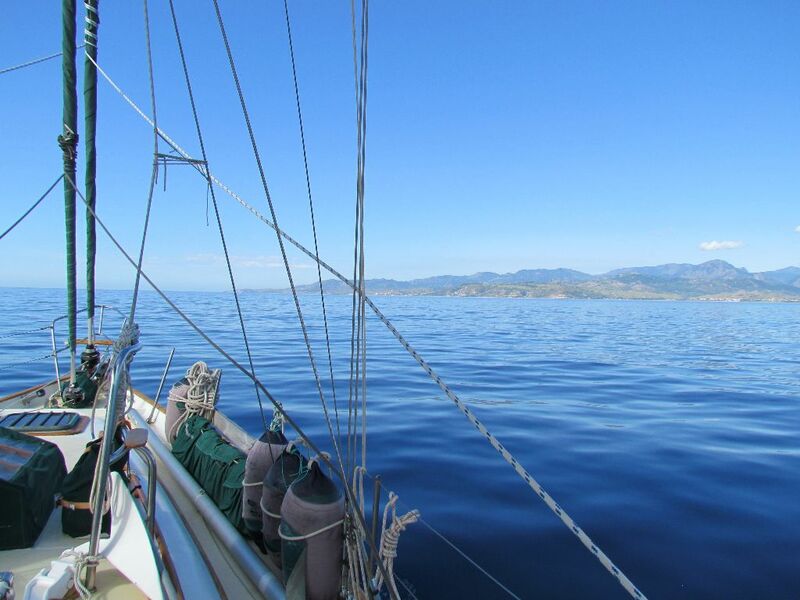 We had a blissful sleep for our first night at anchor and awoke to a calm sea and blue skies. Ahhhhh, here’s to more of this! 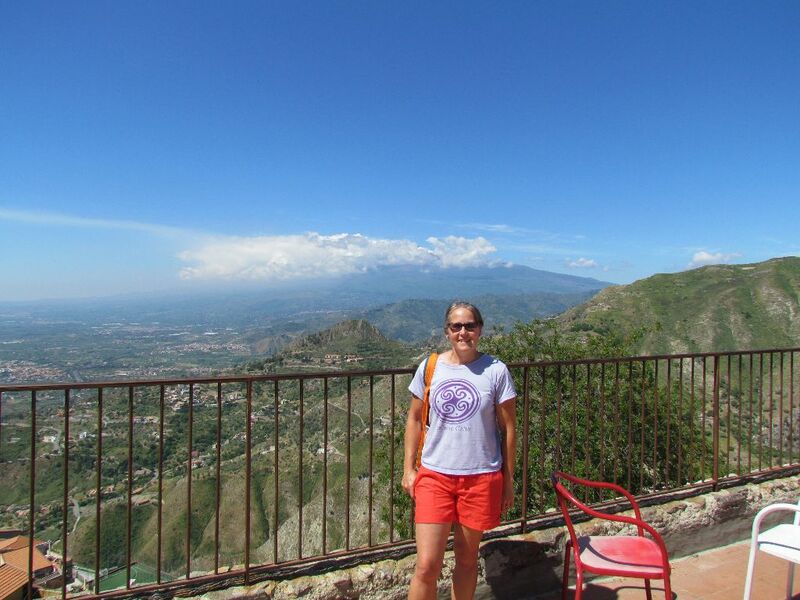 We spent a couple of days in Taormina in 2014 so had explored much of the town. 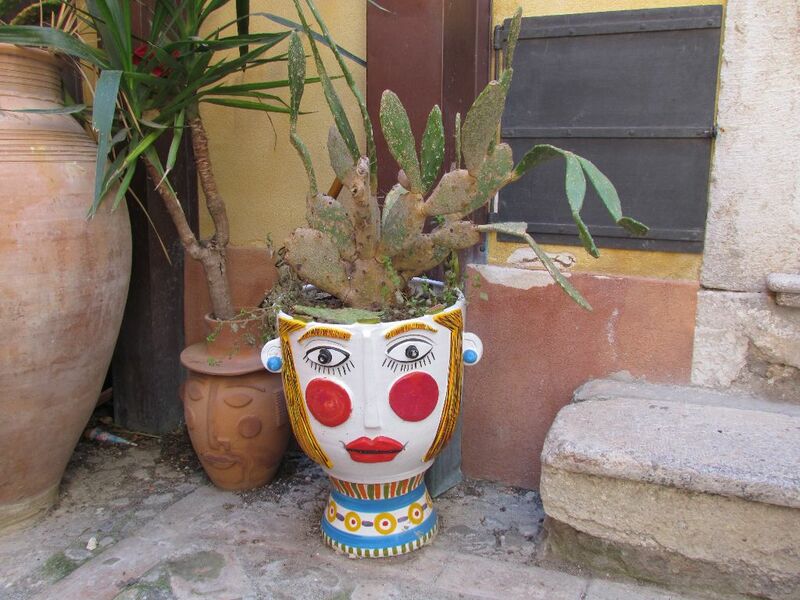 However, I can still never get enough of the pottery heads – if only we could fit one on the boat! I took a walk up the road that winds up the coast. It’s not the nicest of roads to walk with no footpath and plenty of traffic, but I survived. There is a bus. Up over the brow of the hill a beautiful sight awaits looking up the craggy coast to Messina and down below to the pretty island of Isola Bella. I continued down the road and then down steps to the beach, across the pebbly causeway and to the island. It was the first Sunday of the month so entry was free. It was pretty enough for a quick wander but didn’t warrant the usual €4 entry fee. The next walk is for those that are fit with a bit of crazy thrown in. 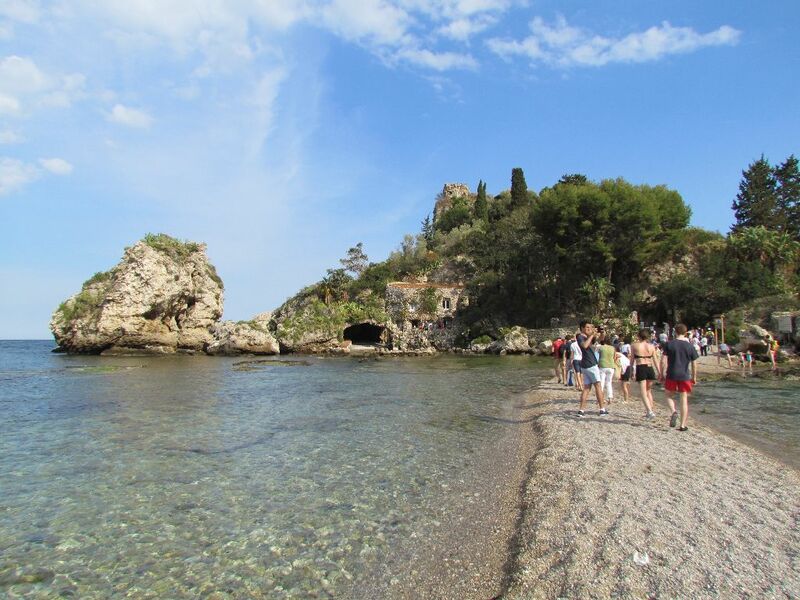 Castelmola is a small village built around a ruined castle that perches on a rock up behind Taormina, at a height of 529m above sea level. 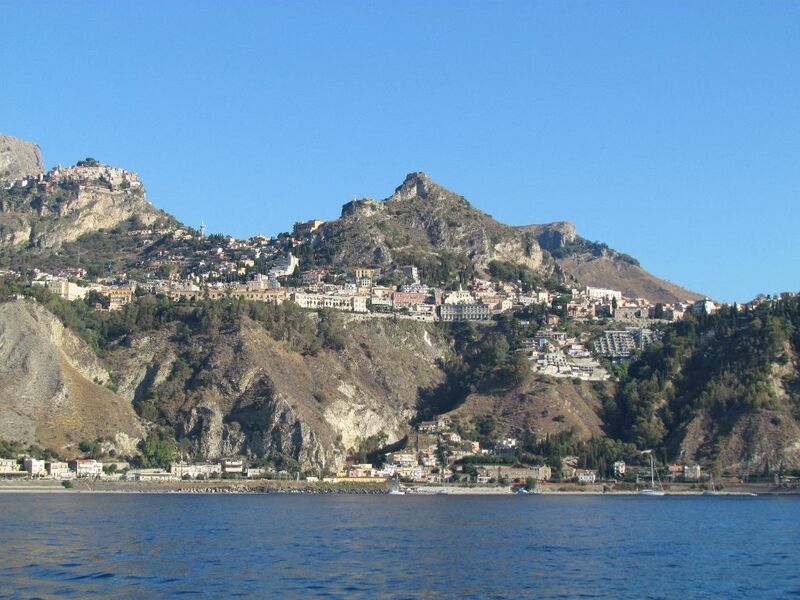 We saved ourselves some height by catching the bus to take us up to Taormina. Sensible people can then take another bus up to Castelmola. But for us it was to be our poor feet and legs. The first part of the route was on an old mule track called Salita Branco. 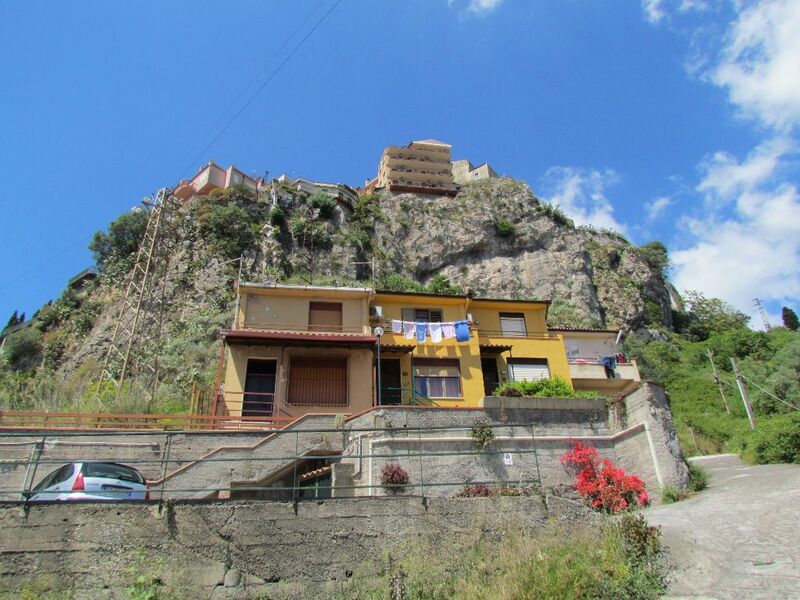 We then crossed the main road up to the village and took a pedestrian route that defied logic as to how it was going to get us up the crags looming above us. But somehow the path got us there and we emerged sweaty and weary to a square with impressive views down to Taormina and across to Italy. The village was pretty but touristy with little lanes to wander and views around every corner. More steps took us to the castle ruins at the very top of the rock. On the way back down we took the same route until we reached the road and continued along it to the church of Madonna delle Rocca. 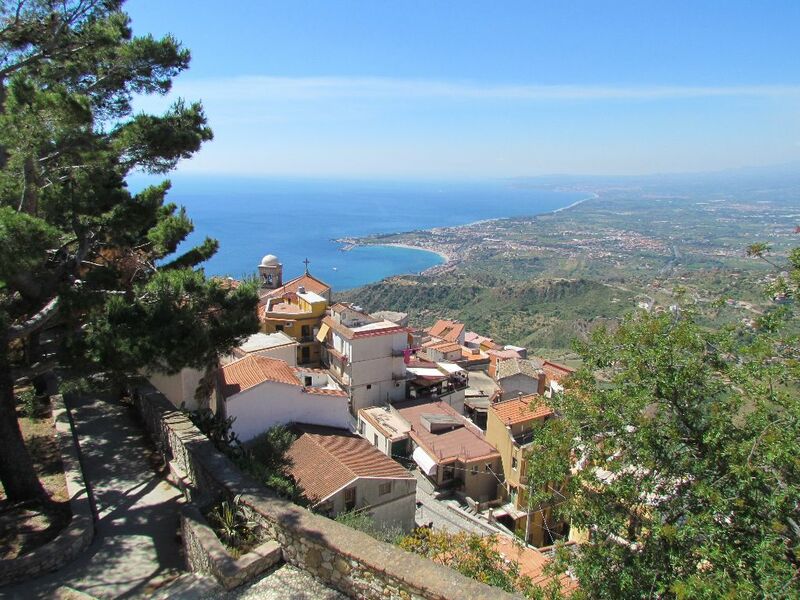 Here we could see Taormina spread out below us and way below, Emerald still where we left her (always a relief to see). Anchor in sand, held first go. There are rocks closer in to shore then a large sandy area beyond. It can be swelly. Weather – started clear and sunny with a NW F5 from the land. 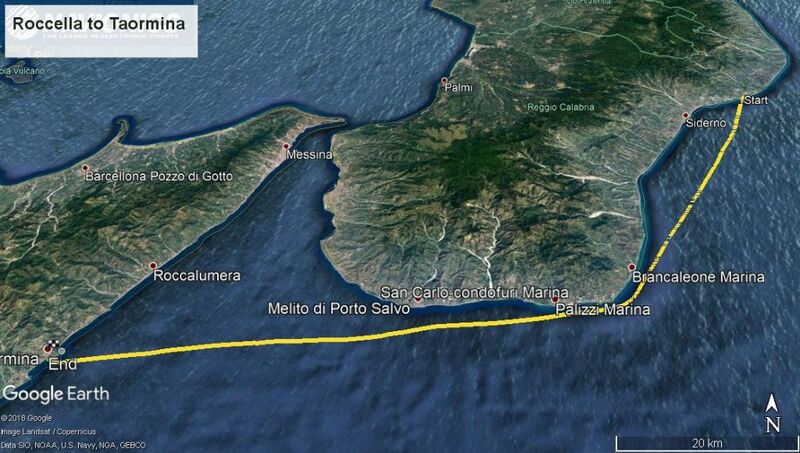 That eased and went west, then south then a F6 from out of Messina as we passed Melito di Porto Salvo. We had a tide pushing us south. Part way across the wind eased, going westerly and F3. We could see a storm over Sicily, but this moved away in land before we arrived. How can I suscribe to your blog ? I don t have instagram .